To Cite: Hasanuddin S, Ramana I V, Mohammed Z. Macrodont Molariform Premolar: A Rare Case of Orthodontic Significance, Iran J Ortho. 2018 ; 13(2):e11037. doi: 10.5812/ijo.11037. Introduction: Macrodontia or Megadontia or Megalodontia is simple enlargement of all tooth structures. Most of the literature regarding this condition belongs to 1970’s and 80’s and very recent clinical case reports in different ethinic groups are lacking. The etiology of unilateral versus bilateral macrodontia of premolars is unexplained till date. The prevalence of macrodontia of premolars in mandible is higher than in the maxilla. Isolated macrodontia of second premolars has been known by many synonyms like “Macrodont molariform premolars” and “Megadonts”. Case Presentation: A 16 year old male adolescence patient had reported with a complain of forwardly placed upper front teeth. Routine clinical examination revealed a uniquely-appearing second premolar on the right side of the mandibular arch. The surface area of the crown was two to three times greater than that of normal premolars. There was crowding of the lower anterior teeth with labial placement of lower canines. 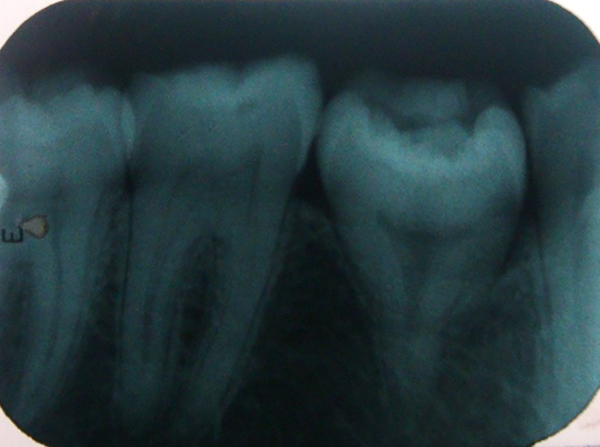 The intraoral periapical radiograph showed a huge premolar tooth with a single, short, stunted and tapering root. The Model analysis favours expansion of the mandibular arch and extraction of the premolar teeth in maxillary arch for contraction of the arch. Conclusions: For proper space management, any developmental anamoly involving the shape of the tooth such as a macro premolar or an erupted odontome has to be extracted as early as possible, as part of the orthodontic treatment plan and fixed appliance therapy initiated. Treatment of macropremolars is a challenging task for the orthodontist, as it requires accurate space analysis and space management. Copyright © 2018, Iranian Journal of Orthodontics. This is an open-access article distributed under the terms of the Creative Commons Attribution-NonCommercial 4.0 International License (http://creativecommons.org/licenses/by-nc/4.0/) which permits copy and redistribute the material just in noncommercial usages, provided the original work is properly cited. Macrodontia of single teeth is a rare shape anomaly. Etiology of single teeth macrodontia is unknown. Occasionally localized macrodontia occurs in facial hemihypertrophy (1). Though the macrodontia of individual teeth and premolars have been repored in literature in the past, it still remains a very rare clinical entity in recent times. In the literature, there are five papers reported on shape anomalies in mandibular second premolars alone, out of which two were unilateral (2, 3) and three were bilateral (4-6). 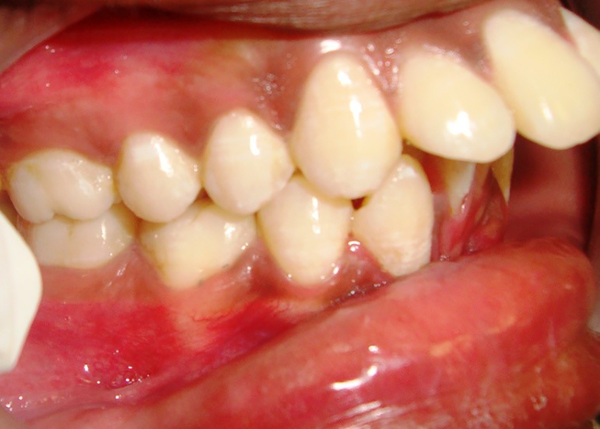 The present case report discusses the unilateral macrodontia of second premolar tooth in a young adolescence male patient. A 16 year old male adolescence patient had reported to the department of Orthodontics with a complain of forwardly placed upper front teeth. Routine clinical examination revealed a uniquely-appearing second premolar on the right side of the mandibular arch. The Premolar was of increased dimensions than that of the contralateral side with an increased occlusal table and wide occlusal fissure, predisposing it to dental caries Figure 1. All other teeth were of the normal dimensions. The surface area of the crown was two to three times greater than that of normal premolars. The first premolar on the left side was extracted couple of years ago. There was crowding of the lower anterior teeth with labial placement of lower canines. The maxillary anterior teeth were proclined and overjet was increased and overbite was marginally increased than normal. Occlusion on the right side is end-on occlusion and on the left side is Angles class I malocclusion. The intraoral periapical radiograph showed a huge premolar tooth with a single, short, stunted and tapering root. The model analysis favours expansion of the mandibular arch and extraction of the premolar teeth in maxillary arch for contraction of the arch. The patient had a clear medical history. Examination of siblings and parents revealed no similar dental anomalies and parents were unaware of these anomalies having been present in their own siblings or parents. For proper space management, the Macro premolar has to be extracted as part of the orthodontic treatment plan and fixed appliance therapy initiated as early as possible. However, there will be additional left over space in the mandibular arch, which is expected to remain after the orthodontic correction is completed (Figures 1 - 3). The overall prevalence of macro premolars was found to be 1.1% with prevalence in males (1.2%) slightly higher than females (0.9%) in a study by Brook (7). In the same study “Teeth larger than the range of normal for a given population are termed megadont”. Isolated macrodontia, when associated with second premolars alone, appear to arise only in the mandible (8). Ludwig described the morphological variations of mandibular second premolars and characterized seven morphological traits using 452 set of models from six ethnic groups (8). However, he was unable to produce the prevalence data about macro premolars, as none of the models demonstrated morphology similar to macro premolars. Most of these cases were reported in children about 8-14 years, as these macro premolars tend to disrupt the developing occlusion and in some cases they cause, gingival or alveolar enlargements, as they erupt in the oral cavity during the 11th and 12th year of life (9). Characteristics such as size, shape and fissure pattern of teeth are genetically determined. However no heredity factors have been indicated in macrodontia (8). In all the recorded cases, the similarity in morphology of the macrodonts found is striking and like in the present case, the right side second premolars are affected more commonly than the left side. The Differential Diagnosis of the condition comprise of Fusion of two premolar teeth or fusion of one tooth bud with a supernumerary tooth bud. In Fusion clinical appearance depends on the stage of tooth bud formation when they are fused. Normal complement of teeth may not be present (1). Multituberculism has been reported previously in combination with macrodontia and other morphologic anomalies involving the entire dentition. As in the present case, in most cases, a fine pulpal extension has been shown in the dentinal core at the cusp. Invagination could be either the result of active proliferation of an area of the enamel organ with infolding of the proliferating cells into the dental papilla, or of displacement of a part of the enamel organ into the papilla as a result of abnormal pressure from the surrounding tissue (10). Mandibular second premolar teeth are recognized to be variable in their presence, absence, size and shape (8). But, the distinct morphology of these unilateral macro premolars, need a more precise and accurate description ‘Macrodont molariform premolars’ as termed by Dugmore (9). For proper space management, any developmental anamoly involving the shape of the tooth such as a macro premolar or an erupted odontome has to be extracted as early as possible, as part of the orthodontic treatment plan and fixed appliance therapy initiated. Early intervention is required to correct the orthodontic problems with macro premolars in young adolescence. Treatment of macropremolars is a challenging task for the orthodontist, as it requires accurate space analysis and space management. Patient Consent: Written consent from the patient is taken prior to the beginning of the treatment. 1. Shafer WG, Hine MK, Levy BM. Developmental disturbances of oral and paraoral structures. A textbook of oral pathology. 4th ed. Philadelphia: Saunders-Elsevier; 1974. p. 37-86. 2. Groper JN. Macrodontia of a single tooth: Review of literature and report of case. J Am Dent Assoc. 1987;114(1):69. [PubMed: 3468170]. 3. Reichart PA, Westergaard J, Jensen KA. Macrodontia of a mandibular premolar. Oral Surg Oral Med Oral Pathol. 1977;44(4):606-9. doi: 10.1016/0030-4220(77)90305-X. [PubMed: 269354]. 4. Primack JE. Individual bilateral megadontism: Report of case. J Am Dent Assoc. 1967;75(3):655-7. [PubMed: 5231549]. 5. Peck S, Peck H, Phaneuf RA. Megadontism anomaly of the mandibular second premolars. Oral Surg Oral Med Oral Pathol. 1983;55(5):543. doi: 10.1016/0030-4220(83)90245-1. [PubMed: 6575347]. 6. Hermel J, Yardeni J, Haas N. Bilateral "molarization" of teeth erupted in the region of the second mandibular premolars. Am J Phys Anthropol. 1968;28(3):345-50. doi: 10.1002/ajpa.1330280321. [PubMed: 5675897]. 7. Brook AH. Dental anomalies of number, form and size: their prevalence in British schoolchildren. J Int Assoc Dent Child. 1974;5(2):37-53. [PubMed: 4535299]. 8. Ludwig FJ. The mandibular second premolars: morphologic variation and inheritance. J Dent Res. 1957;36(2):263-73. doi: 10.1177/00220345570360021701. [PubMed: 13416461]. 9. Dugmore CR. 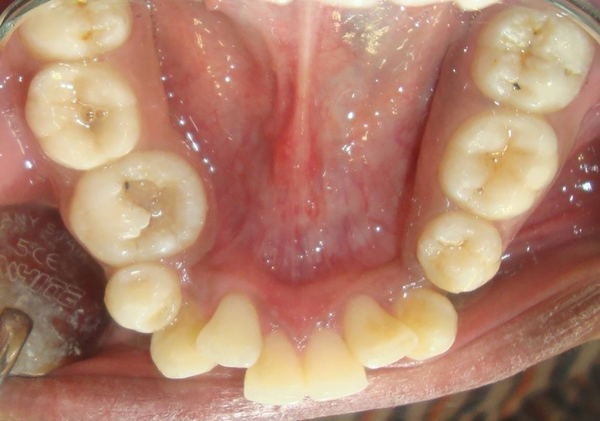 Bilateral macrodontia of mandibular second premolars: A case report. Int J Paediatr Dent. 2001;11(1):69-73. doi: 10.1046/j.1365-263x.2001.00215.x. [PubMed: 11309876]. 10. Reichart PA, Metah D, Sukasem M. Morphologic findings in dens evaginatus. Int J Oral Surg. 1982;11(1):59-63. doi: 10.1016/S0300-9785(82)80050-1. [PubMed: 6811459].